R2-D2 is no longer science fiction. Talking devices, sensors, thinking systems, self-driving cars and drones have entered real life. Entire consumer categories including fitness, health care, automobiles and the home itself are now creating the consumer Internet of Things. We find ourselves in the midst of widespread, global deployment of universal connectedness. Smart devices will lead to innumerable changes in the ways that consumers experience everyday objects. Products that have had a clear historical identity will become “something more” than they have always been. The door lock, which served to prevent strangers from entering our home when we are away, now also serves to allow trusted people to enter our home and put away our groceries when we are not there! This change in the lock’s identity will necessarily lead to a parallel change in consumer experience. While a consumer’s experience of the lock was previously one of having a dependable guard that provided a sense of security, consumer experience of a smart lock could, instead, shift to a feeling of working with a trusted partner that enables rather than prevents access. We believe that such scenarios will be replicated again and again in countless contexts in the smart home. Common household objects, such as a toaster or a refrigerator, can become active partners in interaction. Previously unrelated devices, such as a door lock, a security camera and household light bulbs, will work together as an assemblage. In the process they will be able to create experiences that none of these devices could do on their own. The scope of these changes challenges marketers and consumers alike. In this issue we explore a range of problems that marketers face as the Internet of Things disrupts consumer behavior, as well as some solutions to these problems. Stefano Puntoni notes that while intelligent automated products can save time for consumers, there is a dark side as well. Consumers might be uninterested in these products when the task they are freed from has been an important part of their own identity. Markus Giesler and Eileen Fischer further analyze the dark side of consumers’ interactions with IoT devices. They describe doppelgänger images, consisting of negative stories and meanings about devices, that emerge when IoT products behave in unexpected and often disturbing ways. Marketers get recommendations for how to deal with negative images. Larry Downes addresses usability and security problems that consumers encounter with the IoT and present strategies to navigate the minefield of early market failures and ultimately succeed in this hyper-competitive market. William Rand suggests using the Theory of Complex systems to guide the not always easy to predict outcomes from a network of IoT interactions. Paul Pavlou addresses the concern that IoT systems might make the entire human workforce redundant. He urges us to consider not just Artificial Intelligence, but also Augmented Intelligence, where humans and machines work together to solve problems neither could solve on their own. Finally, Rudolf Aunkofer from GfK outlines how the customer journey changes in an IoT environment and how the concept of customer centricity needs to be reconfigured. Products that have had a clear historical identity will become “something more” than they have always been. For consumer IoT adoption to expand beyond the niche segments of technologically sophisticated upscale consumers and technology-focused DIYers, marketers must do a better job of understanding the actual value of smart products. Currently, marketing focuses on individual and often expensive products like voice assistants, smart thermostats and smart light bulbs or curated “starter kits.” To be sure, some categories are finding some mainstream success. Smart speakers like the Amazon Echo and the Google Home are now in 20% of homes with WiFi in the United States. However, many consumers are struggling to find the value in replacing their current light bulbs, switches and monitoring devices with more expensive versions. The average Joe and Jill do not see much benefit beyond the novelty factor, and they worry about introducing additional technological complications into their lives. 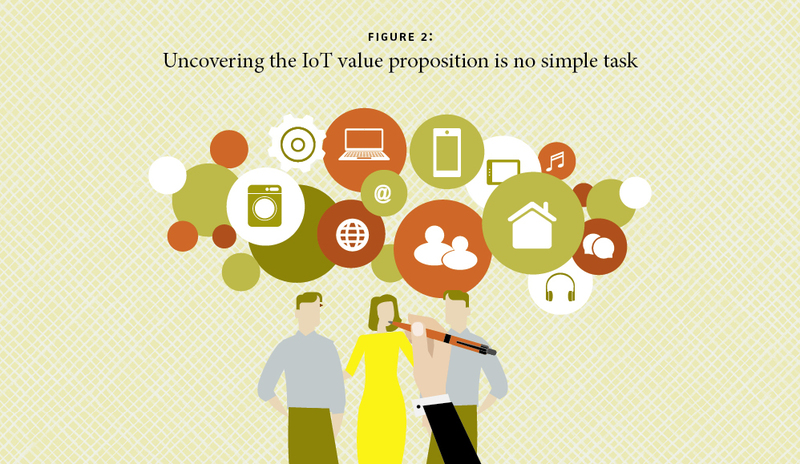 Our research suggests that uncovering the value will take more than is currently being done and will need to involve messaging regarding what the consumer IoT means to consumers. Instead of talking about the smart products themselves, marketers need to focus on the kinds of consumer experiences that are likely to emerge from consumers’ interactions with their devices as their usage increases. Marketing to predefined product use cases is highly limiting because it does not focus on how to allow for the unique experience that is likely to emerge for each individual consumer. Rather than suggest use cases, marketers might encourage users to experiment and create their own experiences, much like the approach Steve Jobs took when he introduced the iPod (see Box 1). The iPad wasn’t sold on the basis of use cases. Steve Jobs emphasized the “magical” and “revolutionary” qualities of the iPad, even as people mocked the name and seemed confused about how to categorize it (giant iPhone? iPod Touch? Kindle?). Apple marketed the iPad as something new, something you could use for “browsing the web, reading and sending email, enjoying photos, watching videos, listening to music, playing games, reading e-books and more.” It was marketed as “everything you already understand, but more.” It wasn’t limited to existing uses, but hinted at novel uses, if only you were willing to adopt one and give it a try. This opened the door to buying an iPad for many different reasons and applications, and as substitutes for everything from an e-reader to a gaming device to a TV. It was not clear at the outset what the iPad would be good for. It had a lot of capacities, but there was little consensus on how they might be exercised. Early reviews emphasized ease of use and a better computing experience and compared the device to existing categories like laptops or netbooks. But it was also emphasized that the device appeared to represent a new category – even if no one could really say what it was. People did not really know what an iPad was when it first came out. But it started to become clearer with regular use. The smart home use cases are like those initial iPad categories of use. Many consumers doubt the value of smart products. For example, what does it mean to have a “smart home”? Yet, marketing efforts are largely focused on telling consumers “buy this smart product if you want a bit more comfort,” instead of letting consumers experience for themselves which interactions do – and do not – lead to the emergence of an experience of comfort. One thing that continually arises in our conversations with managers on the front lines is that the value consumers seem to extract from smart devices depends on the number of devices that can interact with each other. A consumer may start off by purchasing one or two smart devices, say a Nest Thermostat and a Philips Hue Light Bulb. The devices are purchased because consumers believe they are likely to perform a single function well and they view them as separate entities. If those experiences go well, over time, the consumer buys additional devices, for example smart switches, a smart lock, and a hub or relay, and interaction among devices increases. Once the consumer has five or six devices, things start to change: As the number of owned smart devices increases to five to six devices, they start thinking about what would happen if the devices could talk with each other. What seems to happen is that the interactions among the devices start to become more important to the consumer than the individual devices themselves. The meaning of what emerges from these interactions can vary across different consumers, since the consumer is part of the interaction. For example, one consumer might find blue lights vaguely depressing and modify an applet (see Box 2) so the lights are a warmer yellow color to counteract the depression. Another consumer might find that blue lighting evokes an appealing mood, and to complement this, they might further modify the applet so that mood music plays along with the blue lights when it rains. In both cases, something new has emerged beyond the intent of the original applet. The rise of the IFTTT platform (see Box 2), which helps consumers connect individual devices in a user-friendly and easy way, is strong evidence that consumers appreciate the ability to create their own individual IoT experiences. IFTTT is an online service that helps consumers connect devices so they can work together. The company name (pronounced like “gift” without the “g”) is an acronym for If This Then That. The free web-based service lets consumers create easy scripts – if this then that – called applets. An applet is triggered by changes that occur within one service or device such as Gmail, Facebook, Nest or Alexa. For example, an applet may send an email if the user tweets using a hashtag, copy a photo on Facebook to a user’s archive if someone tags a user in a photo or make a LIFX smart LED light bulb turn pastel blue when it is raining. Over 14 million registered IFTTT users have run 75 million applets since it launched, with more than 5,000 active developers building services and 140,000 developers building applets on the platform. When IFTTT launched, the company did not promote specific experiences around these categories. It was a blank slate bottom-up platform that allowed consumer needs and corresponding experiences to emerge. Marketers face the immediate concern of uncovering the value proposition that will help the smart home expand to the mainstream mass market. Most companies are chasing use cases and wondering which combination of entry points – appliance and home entertainment control, energy management, pet monitoring, property protection, safety and security – make the most sense. But, as we have argued, the mass market is not buying a platform or smart products controlled by an algorithm, they are instead buying an experience. The following insights derived from our research can guide marketer action in the early stages of adoption and usage. The smart home will evolve from all the bottom-up interactions that are developed by individual consumers for their unique situations, not from a small set of five or six top-down use cases. Saying there are five use cases for the smart home is like saying there are five uses for the Internet. Configuring smart home starter kits and devices in a way that consumers can figure out for themselves how best to use them allows individual uses to emerge from the bottom up, rather than being dictated from the top down by marketers. We can’t assume that consumers will experience a feeling of “safety and security” just because we tell them the components in the box represent that experience. Instead, we need to ask: In what ways will consumers and devices interact with each other inside of a given home to create the experience of feeling safe and secure? The challenge in implementing a bottom-up approach comes down to finding the right balance between ease of use and rule complexity to permit experience to emerge. IFTTT, for example, is easy to learn and use, and while it can connect hundreds of different devices and online applications with each other, the individual rules are simple and straightforward if-then combinations. Since we do not yet know what combinations of interactions will lead to particular experiences, it is critical to encourage habitual repetition of these bottom-up interactions in order to help stabilize consumer IoT assemblages. Habitual repetition involves performing routine behaviors over and over again until they become habits. For example, every time you leave the house, your Nest thermostat knows you’re gone and lowers the temperature to 68 degrees; every time your laundry is done, your washing machine texts you; every time you run out of Tide laundry detergent, you press your WiFi-connected Amazon Dash Button to reorder. When heterogeneous components – lights, thermostats, apps, appliances and people – interact over time in a predictable way, the behavior resulting from the habitual repetition will create a stable stream of interactions which in turn will stabilize the IoT experience for consumers. Without these ongoing interactions, there is no consumer IoT experience, just a collection of individual smart products. Marketers obviously need to stimulate purchase of individual devices, but the real focus should be on usage, encouraging regular interactions among those products as quickly as possible. Marketers need to encourage habitual repetition of IoT interaction in the early adoption phase, but they must simultaneously find ways to somewhat destabilize the various IoT assemblages in order to encourage deeper adoption and usage. 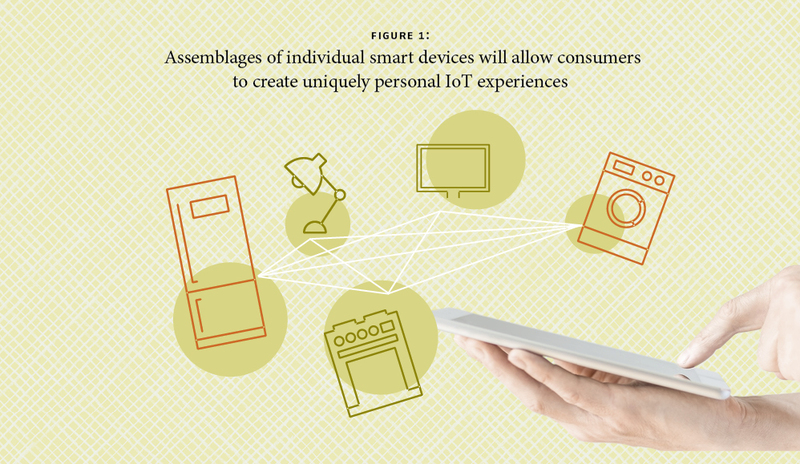 Yes, interaction with smart product assemblages must become routine; but to keep consumers from getting bored as they gain experience with smart products, marketers must encourage consumers to experiment and go a step further with the IoT. So marketers must consider how to give consumers a gentle push, e.g., with new capacities of existing smart products, new rule engines, new products and so on, if they want consumers to move beyond single devices and starter kits. This will also be a key way to encourage habitual repetition. Our work predicts that many different individual consumers interacting with their unique constellation of smart products will seek similar experiences even though they may have taken very different paths to get there. Smart home data streams of device interaction from individual smart home assemblages will provide the raw material for inferring segments of smart homes that behave in similar ways. It is important for marketers to pay attention to these segments, because they provide important clues to the commonalities and general meanings of consumer IoT experiences. This may be contrasted with the current practice of the a priori segmentation of smart homes based on use cases. Thus, the process of market segmentation also proceeds bottom-up rather than top-down. The mass market is not buying a platform or smart products controlled by an algorithm, they are instead buying an experience. The consumer IoT expands simple interaction between people and products to include much more complex patterns of interactions. While this may seem like a natural progression, we believe that the implications of these interactions for consumer experience – especially when they occur with the everyday objects and devices typically found inside people’s homes – will be nothing short of revolutionary. Predictions are difficult, but just as the Internet revolution that began nearly a generation ago brought staggering change to nearly every aspect of human life, we believe the consumer IoT represents another wave of change that is likely to be astonishing and even a little bit frightening. As events unfold, the insights we have been able to derive thus far from our research may help managers as they struggle to understand the strategic marketing implications of the consumer IoT. The first step is to think carefully about not only the immediate challenges involved in fostering early adoption but on developing the mass market and encouraging habitual use to encourage retention. We hope these ideas help. Hoffman, D.L. and Novak T.P. (2018): “Consumer and Object Experience in the Internet of Things: An Assemblage Theory Approach,” Journal of Consumer Research, Vol. 44(6), 1178-1204.